Nynas’ tyre tests have shown that NYTEX® 4700 is an excellent tool to improve fuel efficiency – with no compromises in traction. Tyre performance is often predicted by carrying out laboratory scale rubber compounding studies. Traction, tread wear and rolling resistance are then evaluated. Tyres, however, are complex, and tread compound is only one of the factors influencing tyre behaviour – there is no perfect correlation between lab studies and tyre tests. Numerous lab studies carried out by Nynas indicate that naphthenic oils can reduce rolling resistance. Many tyre polymers have relatively low polarity, so only a limited number of aromatic groups in oil is also desired. This is particularly the case in all season and winter tyres, which are often composed of NR, BR and low Tg SBR. Their compatibility with naphthenic oils is extremely good. To verify the correlation between laboratory and field tests, Nynas launched an extensive tyre testing programme. f-SSBR/silica-based tread compounds were prepared using four different tyre oils: naphthenic oils NYTEX® 840 and NYTEX® 4700 and Group I refining sidestream derivatives TDAE and RAE. These were then used in retreading: carefully selected tyre carcasses were retreaded in collaboration with retreading specialist Kraiburg Austria. Performance was then evaluated in tyre tests. Nynas’ tyre test programme confirmed that naphthenic oils can improve rolling resistance and traction without compromising any other tyre property. Car manufacturers are putting pressure on tyre companies to reduce rolling resistance to meet their own CO2 reduction targets. Naphthenic oil provides tyre compounders with an excellent tool to improve performance. Wet traction and rolling resistance tests were carried out by Prüflabor Nord. They followed UNECE Regulation No. 117, which is used in determining European tyre label ratings. Essentially the same regulation is used in other countries with tyre labels such as Japan, Korea, Brazil and soon also China. In a typical dynamic-mechanical analysis (DMA) of tyre compounds, the glass transition temperature (Tg) of oil affects rubber behaviour. Higher oil Tg leads to higher tan delta at 0°C. This in turn is the most common wet traction indicator: the higher the tan delta, allegedly the better the traction. Aromatic oil (DAE) and RAE with higher Tg typically yield 5-15% higher tan delta than other tyre oils such as TDAE and naphthenic oils. Correlation of tan delta with traction, however, is not perfect. Wet traction results are presented in the chart below. Tyres were compared with a 16” Uniroyal reference tyre (SRTT), and breaking results were indexed. It was found that the four tyre specifications tested yielded very similar indexes. Considering the deviation in the test, wet traction of each tyre specification was equal. Although the RAE compound had 10% higher tan delta, it did not result in better traction. Reducing rolling resistance leads to an improvement in a vehicle’s fuel efficiency. In rubber compounding, the property that best correlates with rolling resistance is tan delta at 50–70°C. Compared with wet traction, the correlation of tan delta with rolling resistance is typically a lot better. Again, rolling resistance was determined following the ECE R.117. It was found that all tyres tested yielded the label rating C. There was, however, a difference between different specifications. The best oil in the test, NYTEX® 4700, yielded 5% lower rolling resistance than TDAE. As in the lab studies mentioned earlier, naphthenic oil improved fuel economy without affecting traction. One can naturally discuss whether the 5% improvement is significant. An experienced rubber compounder will surely acknowledge that to achieve the best tyre label ratings, several compounds and several raw materials need to be developed. Naphthenic oils offer an excellent additional tool for rolling resistance reduction. Winter traction of tread rubber can be estimated by looking at a few commonly accepted parameters. Requirements differ remarkably from those on summer tyres: compound needs to remain soft and flexible in the cold. The most common indicator is tan delta at -25°C; yet its correlation with tyre test results is not good. Far better correlation is found between dynamic stiffness and traction. The lower the stiffness in the cold, the better the traction. Many of the world’s leading winter tyres are thus augmented with naphthenic oils, which keep the rubber soft in cold weather. The braking distance of tyres was tested on snow and ice by Test World. Braking performance is indexed using NYTEX® 4700 as a reference tyre. As expected, high stiffness of the RAE compound led to longer braking distances on ice and snow. Three other oils exhibited the same traction on snow. 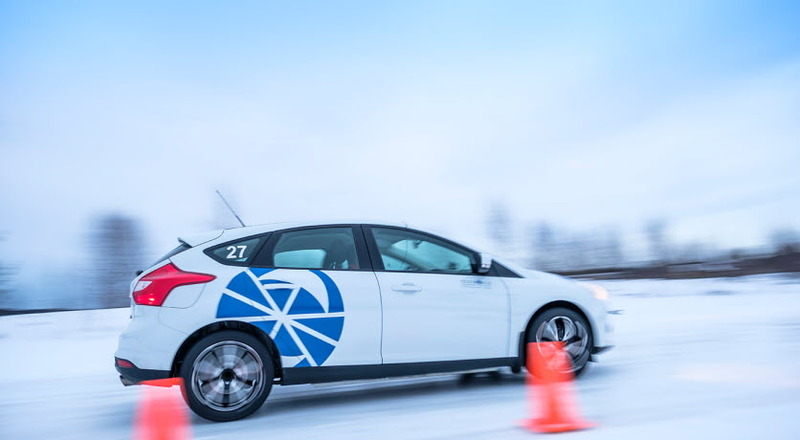 In the ice braking test, however, there were larger differences: naphthenic oils and especially NYTEX® 840 performed very well. RAE was 6% worse than NYTEX® 840 – braking distance (20 km/h to 5 km/h) was 70 cm shorter with NYTEX® 840. If the speed, however, was e.g. 50–60 km/h, the difference would be several metres, and better performance might save lives. The four tyre specifications were also tested for mileage: they were mounted on taxis in Austria and Germany, and tread wear was monitored. As the tyres were mounted on different types of cars, the testing can’t provide perfect accuracy, but it should reveal any serious issues with wear resistance. When the average mileage was extrapolated to 3 mm tread depth, all tyres yielded 35,000 km +/- 2,000 km. Dr. Mika Lahtinen is Technical Manager for the Tyre Group at Nynas, while also advising clients on a senior level. Formerly Head of Tyre Material Research & Development at Nokian Tyres, he holds a Ph.D. in Materials & Polymer Chemistry.